Our main crop potatoes (Maris Piper and Pink Fir Apples) should really have been planted at the end of April. However, it was so cold here that we never got round to doing it. Last week’s heat wave saw an initial flurry of activity. Lots of blue Scottish people rushed out into the sunshine for a freckle top-up and within 30 minutes were rushing back inside to lie down in a cool room because it was “too hot”. We’re never happy. Over the week Mr Mac and I managed to get two large jobs done, one of which was getting the maincrop potatoes planted. The easiest way we have discovered to grow them is in bags. In the ground the worms eat them. Bags can be emptied whenever you need potatoes, they can be moved around the garden and they can more or less be forgotten about. Even though we were late planting them they had been sitting in the greenhouse happily chitting away. For the uninitiated (like I was 3 years ago!) 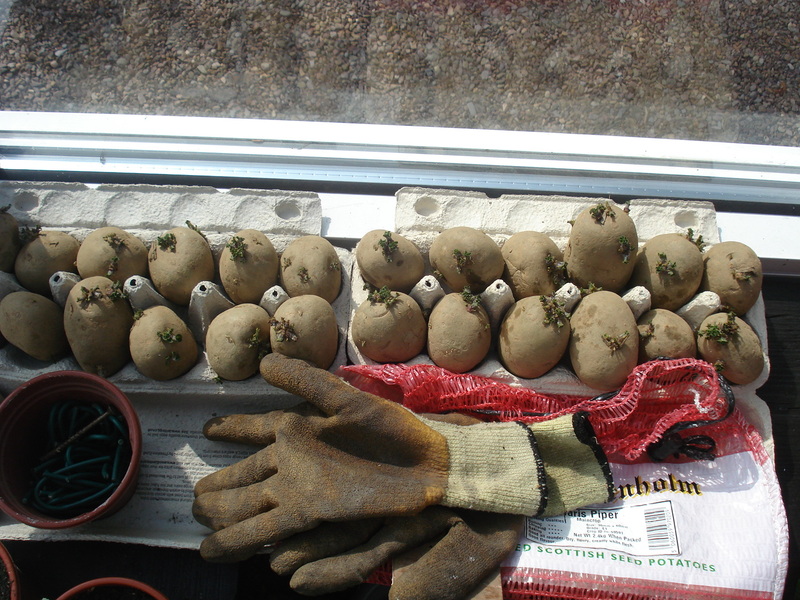 chitting involves sitting the tubers in a box, such as an old egg box, with the growing end facing upwards – recognisable by the cluster of tiny buds (“eyes”) on it. When the shoots are about an inch long they are ready for planting. This gives them a head start, although many people say you don’t need to chit maincrop potatoes because they have a longer growing season! Maris Pipers, chitted and ready for action! 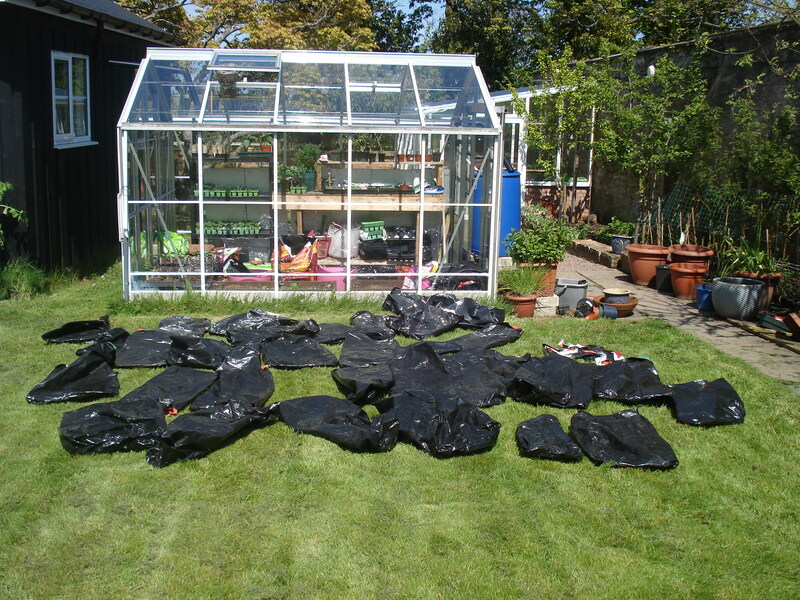 We saved empty compost bags which are the ideal size. They were all washed in a big bucket filled with water, bleach and washing up liquid to kill the bugs. Then they were left in the sun to dry. Turn the compost bags inside out and then roll down the outside. 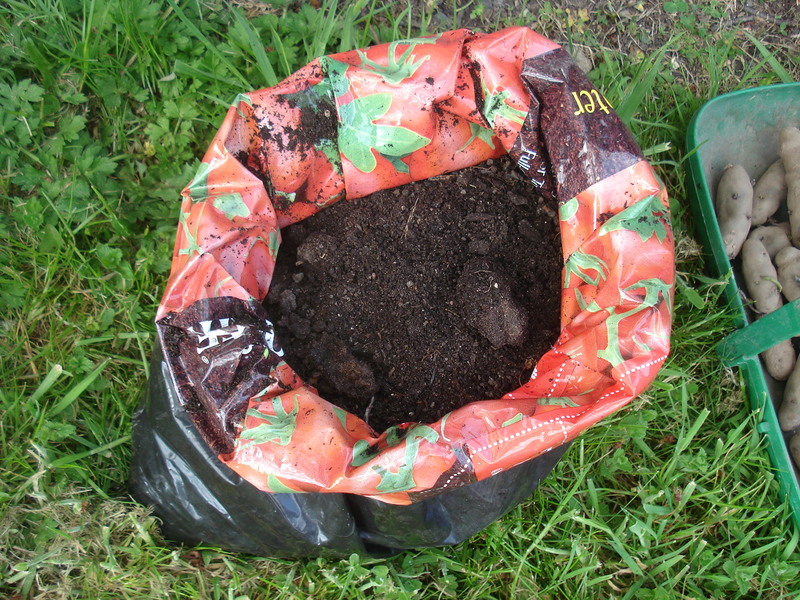 This way, when you need to add more soil the bag can be unrolled to accommodate it. Add some compost to the bottom of the bag. 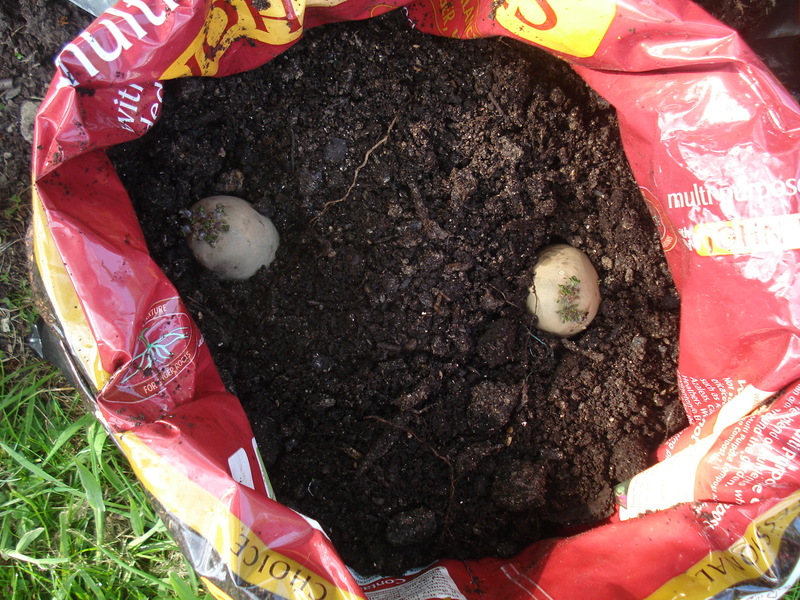 Place two seed potatoes in each bag and then cover with more compost. Work out where to put them all! Rain stopped play! 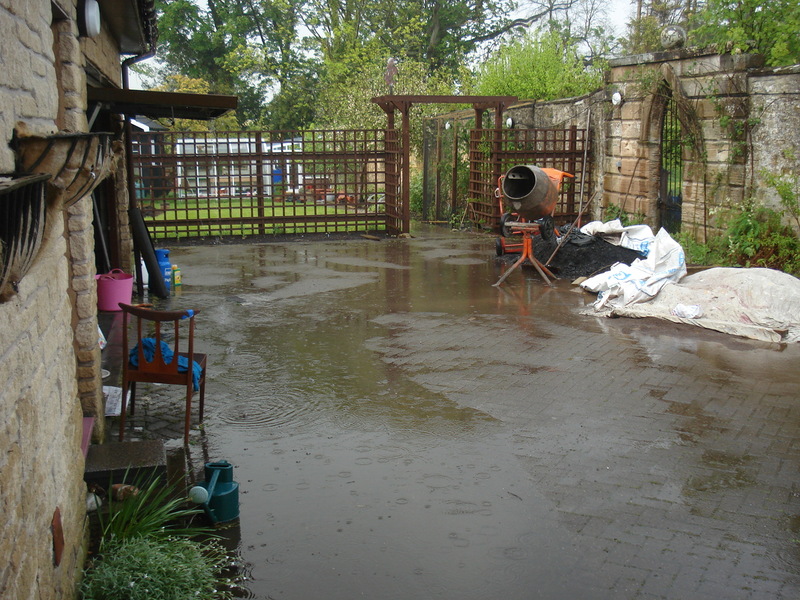 At least we did not have to water anything. We put the bags under two trees where the only things growing were the weeds. 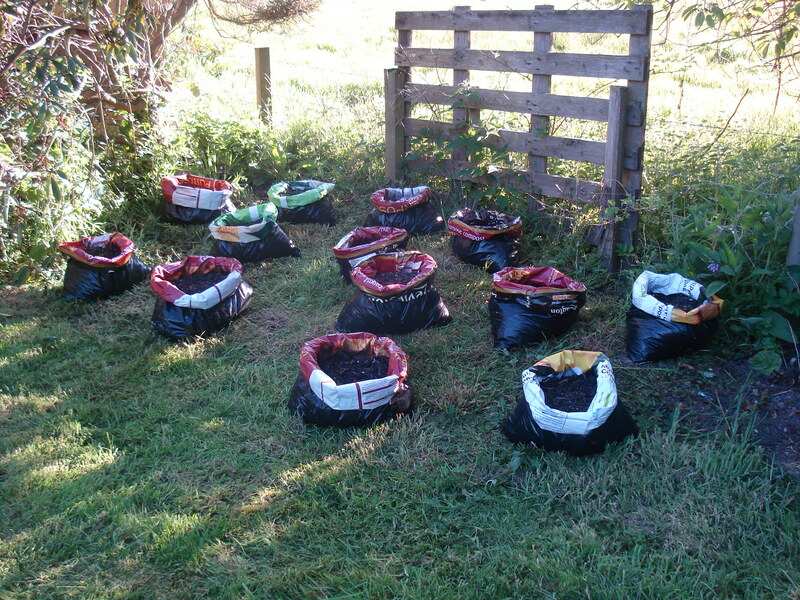 Finally, pierce some holes in the bottom of each bag for drainage and wait for the potatoes to grow! This entry was posted in Vegetables and tagged compost, compost bags, gardening, maris piper, pink fir apples. Bookmark the permalink. I did the bag thing last year with my tatties and got very poor results. Tiny marbles. So mine are in the ground this year. Wish me luck. Good luck! We did both last year. 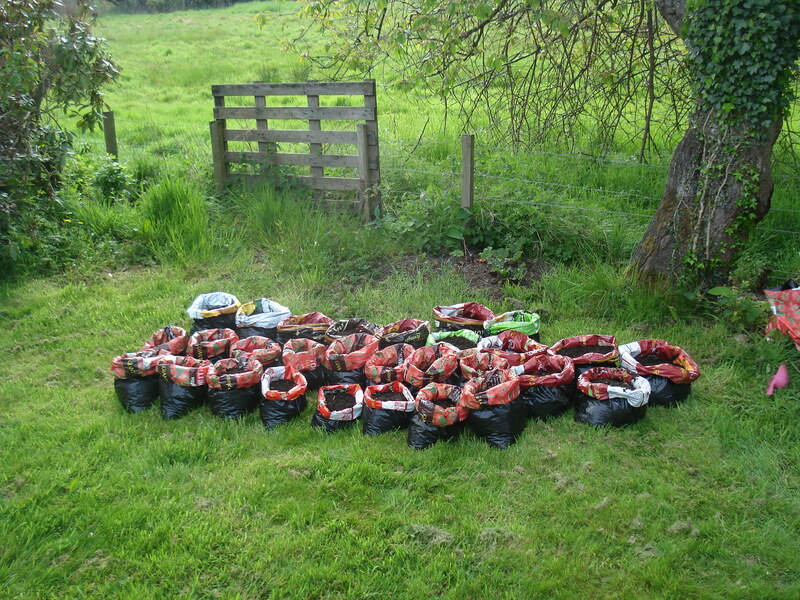 The ones in the ground ended up blighted (our lovely damp Scottish summers!) and the worms ate the majority of them. The ones in the bags were great. I think the secret is to forget about them. What varieties are you growing? I listed the varieties on my blog A garden in the Kingdom of Fife…. copy, cut and paste.. The varieties I chose were Pink Fir, Shetland Black, Arran Victory, Golden Wonder and Kerrs Pink. This is a mix of salad, 2nd Early and Main Crop and Late Varieties. Oh and something I acquired this year was a French Potato Basket…… It has a full time job in the winter holding logs for the multi-fuel stove but it is having a break at the moment. I will post a photo of it in action at the first potato harvest….. I should make it a lots simpler make less mess. I love the bag idea for potatoes. At harvest, just empty the bag. No digging and accidentally nicking the potatoes! Plus, you never have to worry about missing any. 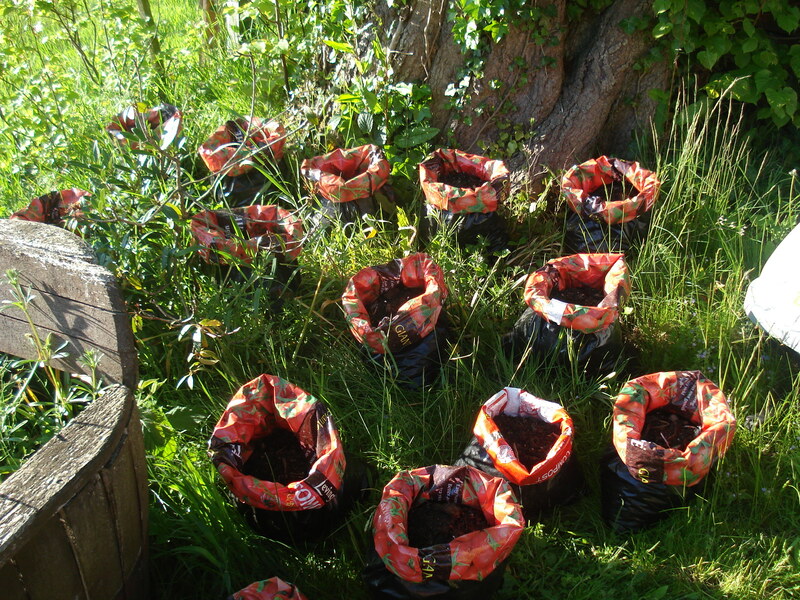 There is also no back-breaking work trying to haunch them up – just scoop some more compost into the top of the bag! I think it is also a great idea for people with very little space or who don’t really “garden” as they don’t take up much room and need very little maintenance. Oh, a wee tip for making holes in the bags quickly. Before you start to fill the bag with earth and tatties. 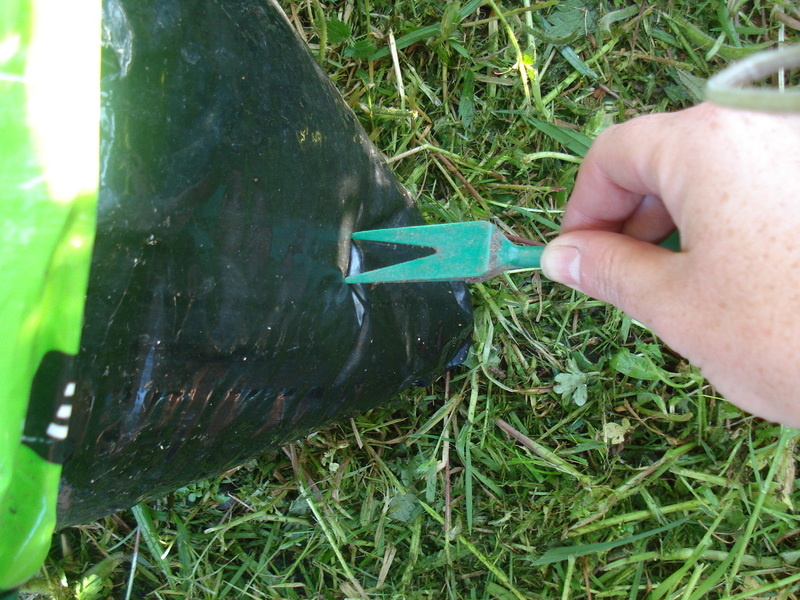 Lay it flat on the soil or grass and drive the garden fork through it a couple of inches from the bottom of the bag….. You get eight holes in one go and no bending down to do it. That is an excellent tip – thank you!